If you like canvas string art projects, you’ll love this creative twist for making a wall hanging. 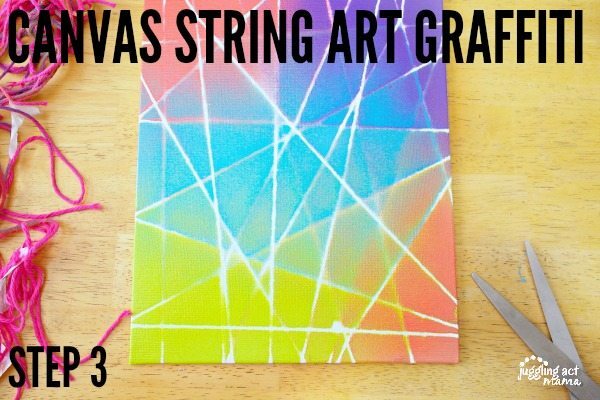 This Canvas String Art Graffiti project is fun for kids and adults alike. While this is a spray paint project, you can use alternative paints or dyes for younger children. Scroll down for the full tutorial and more information. This post contains affiliate links. Children can do this activity if properly protected and supervised. However, for younger children, I would recommend doing this project with Washable Paint Markers (paint daubers) instead of spray paint. You could also use a Tie-Dye Kit and spray bottles and have the children spray the dye onto the canvas. You will still want to supervise children under 14. This project is best done outdoors if you are using spray paint. Be sure to pick up particulate mask. These are available at your local hardware store and are inexpensive. 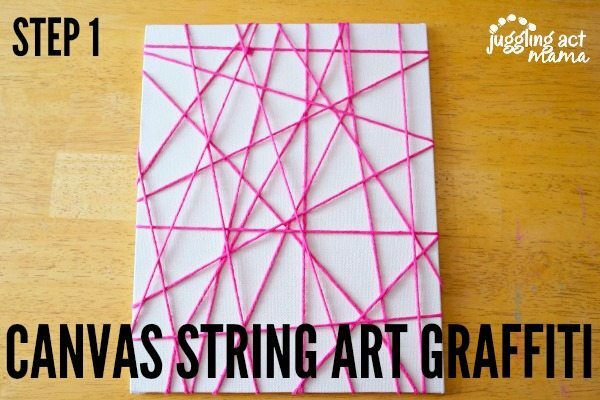 This Canvas String Art project makes fantastic decorations for a playroom or bedroom! You can make a whole set of them using the color theme of your room. 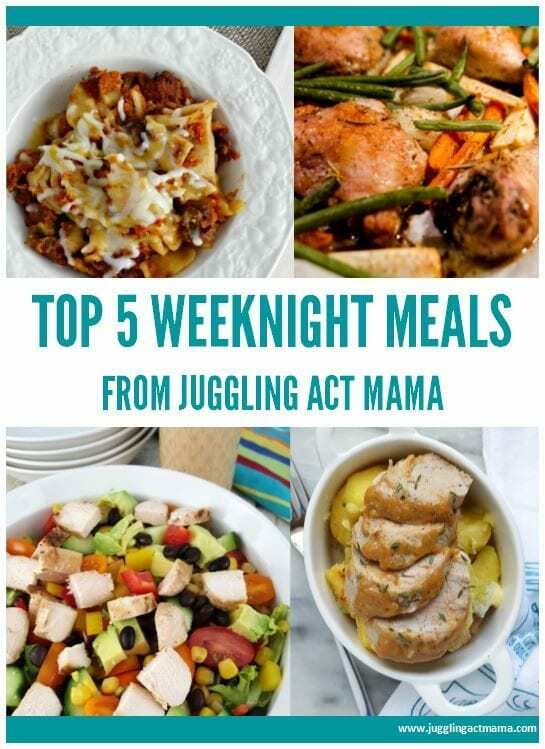 And, you could even personalize them by using acrylic paint and putting your child’s hand print in the center. Then use a Sharpie to write their name and the year for a special keepsake. 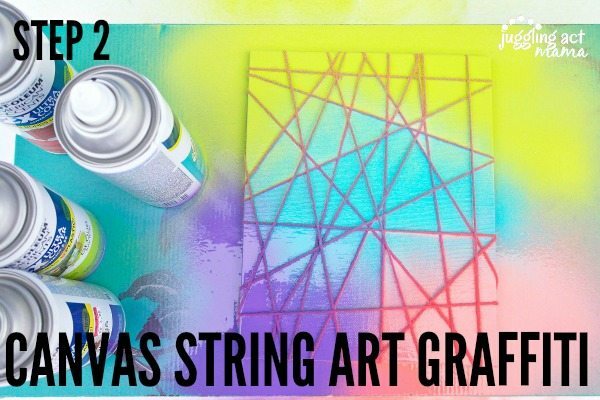 What is String Art, and What Do You Need to Make it? String art project start with colored yard, thread or other string that is string between different points to create a pattern or design. String art patterns can be very intricate. Often, these projects are made using a wooden base and pins or nails, along with a stencil to help with the design. In this case, we did used tape instead of pins or nails and made a very abstract design. For all these reasons, it’s perfect to do with kids, provided of course that they have the proper safety equipment and supervision. Flip the canvas over and tape one end of the yarn onto the back using the masking tape. Turn the canvas back over and tightly wrap the yarn around the canvas in a random pattern. At times, you may need to tape the yarn in place on the back. For example, near the corners. Once you are satisfied with the way your canvas is wrapped. Place the canvas front side up on a piece of plastic or cardboard outdoors or in a well ventilated area. Wear a mask, spray the canvas with different color spray paints. Leave the canvas to dry completely, preferably 3 hours. Cut the string off and remove the tape from the back. Optional* hot glue a string to the back of the canvas if you wish to hang your artwork. This is one of my most favorite projects! 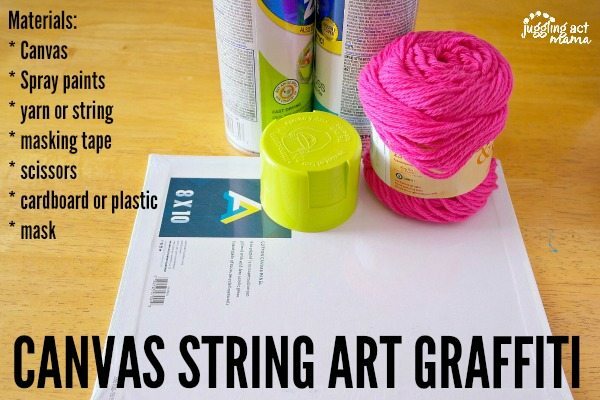 It is a little more unique than typical string art, and there are so many ways you can use your creativity to make it your own. 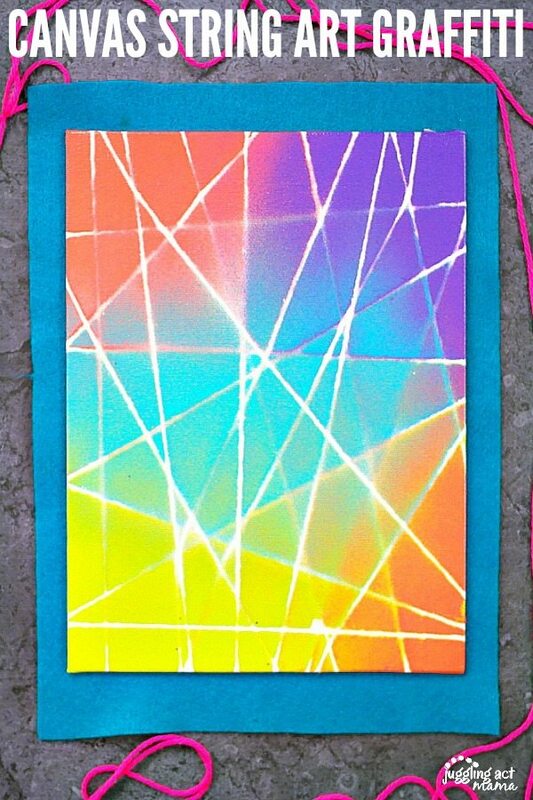 For instance, you could add puffy foam stickers to the canvas after the strings are all in place. Wait until the paint is completely dry before removing the stickers. This is particularly fun if you are hanging it in a room with a fun theme like dinosaurs or unicorns. (These stickers can be found at most craft stores). This looks like a lot of fun. A great way to mix science and art. Hi! I was just wondering, how would you estimate the length of string or yarn you use per canvas? Just wondering in case I do this with a large group! Thank you! The amount of string you use depends on how you want it to look… meaning you’ll want more string for more lines on your canvas. It also depends on the size canvas you use. How would you do one with a hand print? When the painting is done and dried, brush washable paint onto your child’s hand and have him/her “stamp” the canvas with their hand. Have fun!